Local councils may have to close all public children’s playgrounds next week as the sole provider of compulsory public liability insurance threatened to withdraw cover. Geneva-based Seinfeld Global says there was a 178% increase in claims received for ‘play injuries’ last year and that UK councils must reduce the risk by making adventure playgrounds far safer. 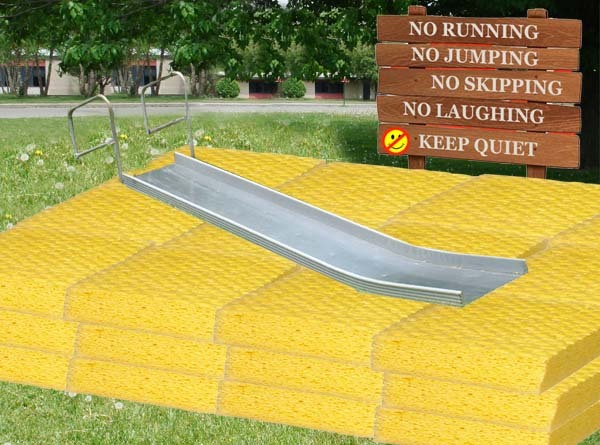 They are calling for slides to be horizontal, playgrounds to be covered with two foot deep sponge mats and for all children to wear crash helmets and protective eyewear. We asked Mr Stumphausen for specific examples of playground claims. ‘Ha, where to start!’ he said, producing a file of the 11 claims they have received. ‘Very, very bad bruises, these we are seeing of the most,’ he said. ‘And the knees, always the knees of the boys that are being banged and how do you say, the grazing?